Is anyone saddling up for tomorrow’s Bike DC, the Washington and Arlington community bike ride? It’s being billed as “a ride through the heart of our nation’s capital” and will take place on over 20 miles of car-free streets. The route is designed as a catch-all circuit, rattling on by some of the city’s top sites, from Pennsylvania Avenue, close to the Capitol, past the White House, to the Marine Corps Memorial, Arlington Cemetery and the Air Force Memorial. Bike DC is being called a ride, not a race, with families taking part as well as more serious cyclists. But for me, biking is best-served with a bit of speed, and the idea that you shouldn’t separate pedals from some pace is behind today’s picture pick. 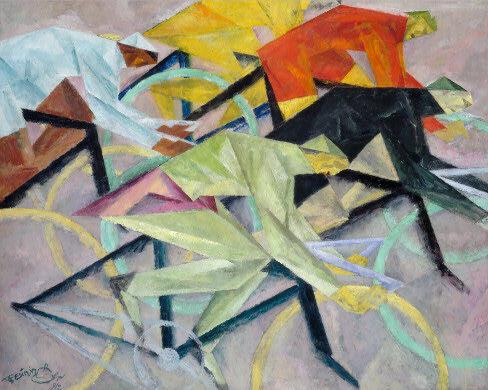 This painting is called The Bicycle Race (1912) and is by an American artist called Lyonel Feininger (1871 – 1956). Born in New York into a family of musicians, Feininger started out studying to become one (it’s what prompted his move to Berlin at 16), but rapidly resolved to turn to art instead. After studying in Paris and Berlin, he became a successful graphic artist, securing work with publications in Germany and the US. In 1907 he turned properly to painting, starting out with landscapes at first. 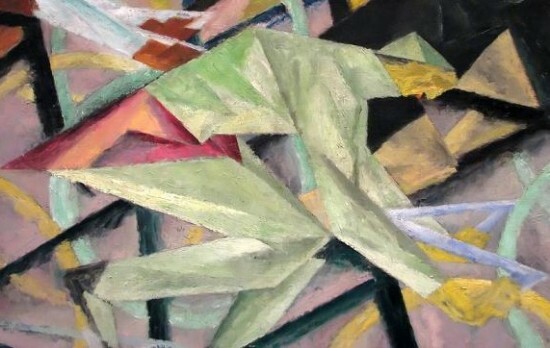 But it was when he encountered Cubism in 1911 that he really found his feet in fine art. The Bicycle Race is compelling in part because its prismatic forms and pale-yet-punchy palette suggest so much about the several art styles that influenced Feininger. 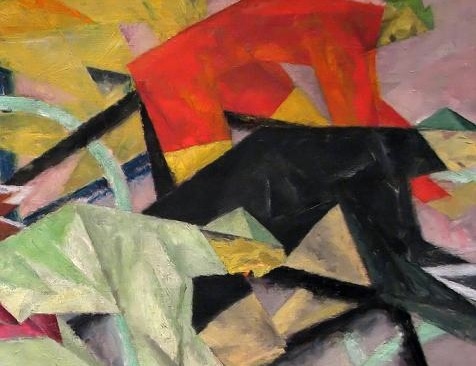 These riders are side-on, but the splintered shapes that angle across their bodies are related to Cubism (1907 – 1914), the radical movement that abandoned traditional, fixed viewpoints and instead showed subject-matter from many sides simultaneously. 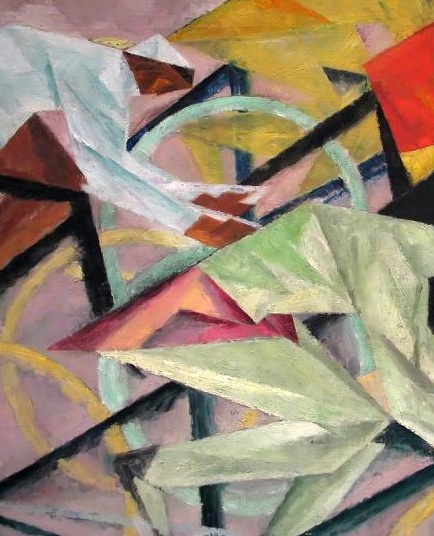 The picture also observes Orphism, a term coined in 1913 to describe a Cubist-inspired abstract style in which light is as important as mass, and which used overlapping planes of bright, contrasting colors. There are also strains of the Blaue Reiter (Blue Rider) here, the Munich-based group of expressionist artists who acted from 1911 to 1914, producing lyrical, mystical paintings, often semi-abstract and again with bright colors. But the multiple, possible influences on this painting are not necessarily the thing that draw you to it at the NGA. Rather, it’s the colors, made luminous by lined shards of cutting light. And it’s the clearly-defined, facetted forms drawn with the lightest of touches. It’s all those upward and downward-pointing triangles that cut across the canvas, contrasting with the hooped wheels interspersed throughout. And the natty network of interlocking planes that patches together the bodies of the bikes as well as those of the racers. Mostly though we might marvel at the way this artist captures and conveys a sense of speed in the scene. Everything (color, shape, light) couples up and contributes to a palpable, pushing, left-to-right movement that creates a feel of pressing progress. Which brings me to one more model for this work: Futurism was an artistic movement (founded in 1909 by the Italian writer Marinetti), which celebrated the modern world, its machines and its technology. The focus that Futurist art placed on representing speed through scattered shapes and myriad colors is an instant connection that can be made here. So rather like tomorrow’s bike ride, which takes in tourist sites left and right, this painting acts as a sort of compendium canvas, racing through some of the top styles of the early 20th century. It’s enough to leave you needing to stop and catch your breath.